Railings only prevent you from seeing far, but Invisirail has found a solution to that problem by providing Invisirail 38.5″ x 55.865″ Glass Railing Panel (10mm). From now on, no more sight obstruction once you install this frameless glass railing. InvisiRail is a household name in innovative glass railing system manufacturing. They utilise glass panels with reliable quality. One other outstanding feature of their products is low maintenance. This model is 38.5 inches in height and 55.865 inches in width. It is built using InvisiPost and comes with holes at the top brackets. It also bears slots for the lower brackets. Strength and durability set it apart. Household safety was top priority when the panels were being made; hence, they are made with corners designed in such a way not to harm pets or children. During manufacturing, it was taken through tempering and heat soaking, followed by bevelling. Its thickness is 10mm, which further improves its strength. It is very clear and transparent with no obstruction. 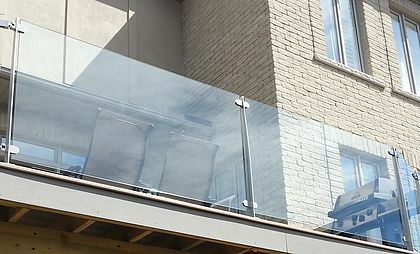 As with most invisirail glass railing panel, this frameless glass railing doesn't require much in the way of maintenance. Furthermore, it is very easy to install. Easy-to-understand installation manual is included in each unit with detailed instructions on how to carry out the simple installation. Its posts are 5/16″ in thickness. The posts are available in 3 different finishes, which further add touch of modernity to things. Get the Invisirail 38.5″ x 57.812″ Glass Railing Panel (10mm). We are certain it will be a great addition to your home or workspace. Don’t wait; get the value and long term savings you deserve today! 38.5″ x 55.865″ Glass Size.